GitHub - sylvainjule/kirby-pagetable: Display subpages in a flexible table section. Kirby 3 only. Display subpages in a flexible table section. Kirby 3 only. Want to be notified of new releases in sylvainjule/kirby-pagetable? 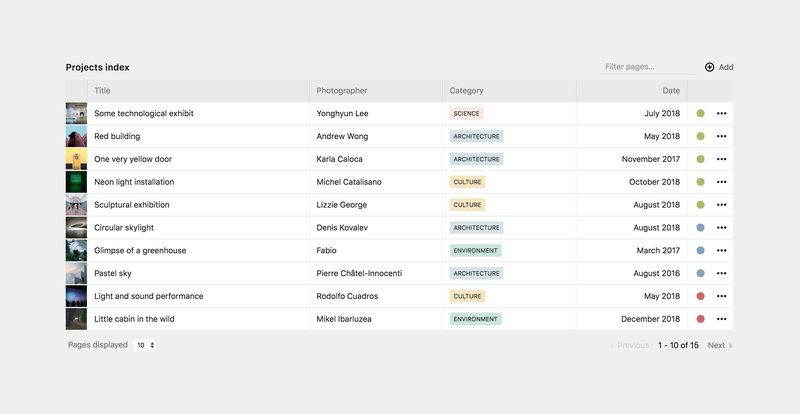 Display subpages in a flexible, sortable and searchable table. This plugin is completely free and published under the MIT license. However, if you are using it in a commercial project and want to help me keep up with maintenance, please consider making a donation of your choice or purchasing your license(s) through my affiliate link. If you are looking for a Kirby 2 version of this field, please check out the index field. You can limit the initial number of displayed pages the same way you could with the usal pages section, only pagination will happen on the front-end. Default is 25. You can also set the limit options displayed in the select input at the bottom of the section. Default is [10, 25, 50]. The column's title, displayed in the head / first row of the table. date: right aligned, expects a string representation of date, as well as a two other required options. Allows you to add a custom class to the column. A class myClass will be added as .head-myClass to its th, and .row-myClass to its td. Enable / disable sorting of the column. If false, this column will be ignored by the global search. You should now end up with the exact same setup than illustrated in the above screenshot. This section is built on top of vue-good-table. Please have a look at https://github.com/jongacnik/kirby-index-field for a K2 version.